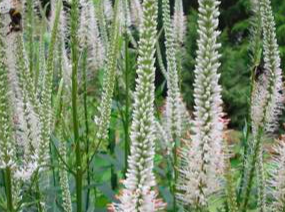 The white flowered form of culvers root- but seldom called that in the PNW. 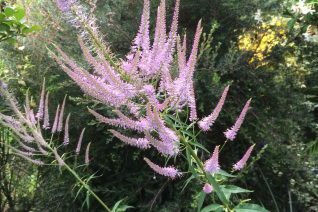 Slender perennial with multiple vertical stems clad in symmetrically space pointed foliage surrounding the stem. At the tips in early summer multiple spires of pure white flowers give a really cool ethereal effect. Massed it is simply one of the coolest plants. Our form rises to just 4′ tall and forms slowly increasing clumps. In autumn the foliage that lines the stems often turns bright yellow and remains for a while- a second season of interest. Full sun to the very lightest shade in any soil of good fertility. Does well even in unamended clay as long as summer water is dependable. Long lived perennial that never requires division or fussing. Cool cut flower for big wild arrangements. Bees love it. Sturdy spire of a perennial with symmetry in mind. Whorls of pointed foliage lines the stems on the 5 tall plants. At the top vertical spikes of fine periwinkle blue flowers appear and grow. They remain pretty for weeks. In fall the still standing stems take on bright yellow fall tones and holds it for several weeks. Full sun and rich, well drained soil with regular summer irrigation Becomes more tolerant of drought with age and establishment. This form is popular for its occasional tendency to fasciate. A harmless contortion of the flower spikes. Cool cut flower.